Grow your beauty business simply by anticipating something your client wants before they ask for it. Raise the bar in customer service by being one step ahead of your client’s needs. Recently I celebrated my husband’s birthday at a high-end restaurant. We had the most exquisite table in front of an open window, which allowed us to watch the sunset and feel the ocean breeze. When the sun went down and the wind picked up, I expressed to our server that I felt a little chilly and wanted to order a cup of soup. The server offered to bring me a wrap so I could enjoy the meal comfortably. Not only was I warm and cozy, I felt cared for. After an amazing meal, it was time for dessert! We expressed that we had no room in our tummy. To my surprise, the server wrapped up the birthday treat with a candle and matches so that we could celebrate at a later time. These are great examples of how a business anticipated customer needs. The customer service was “icing on the cake”, so to speak. Anticipating my needs created magic moments that had me talking about my experience for days. What are some things you could do to anticipate your clients’ needs? 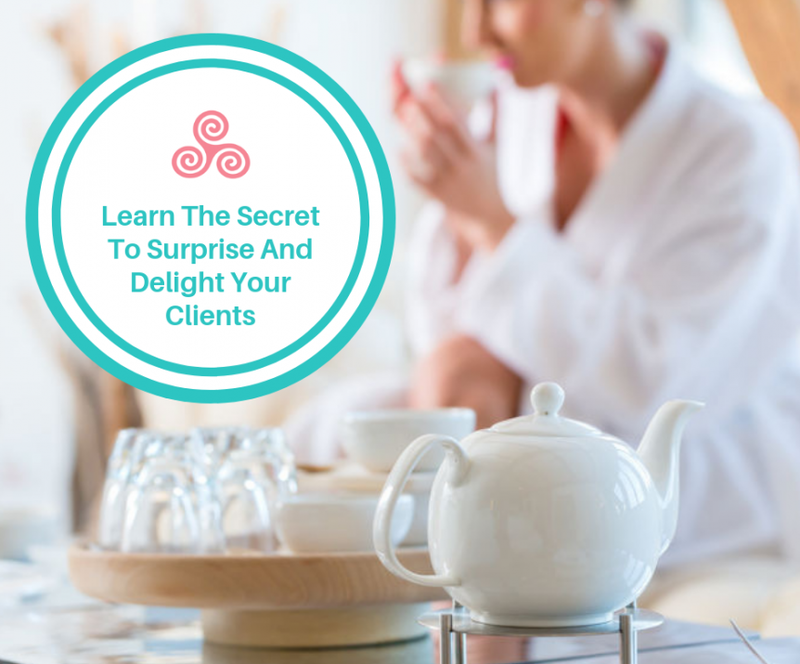 How can you surprise and delight your clients before they even ask? First, we offered to pre-book. Securing your future revenue is more important than taking money today. Lastly, we asked if the client wanted to purchase any gift card for special occasions that might be coming up. This often helped them recall, say, a friend’s birthday was right around the corner. They’d be grateful that we helped them remember and would gladly buy a gift card. By training my team to adhere to this checkout flow, we improved the client experience while improving retention rates, and increasing retail and gift card sales. When you solve a problem for a client, the next challenge often reveals itself. Understand your client’s journey and how they feel. Think about current issues, and what they want to achieve. This will help you offer the right solutions at the right time. In addition, when you listen to your clients attentively, you may be surprised how many clues you can glean from conversations to help anticipate needs before clients realize themselves. Ask a question or do a poll on your social media to understand your clients’ challenges and desired outcomes. Participate in social media groups to find out how your ideal clients talk about their challenges and desired outcomes. Research trending topics using the appropriate hashtags to see what’s top-of-mind for your target market. What’s the best way to find out what your clients expect from your services? Ask them! Get feedback from your clients at the end of their visits. You can simply ask them verbally or if you have a larger team, formalize the process by using a comment card. You can also set up an online survey and ask your email list or social media followers to share input. These insights will not only inform what products or services you should offer but also allow you to see from your clients’ perspectives so you can accurately anticipate needs and cater to expectations. Word-of-mouth and referral marketing is a powerful and cost-effective way to promote your beauty business. When you anticipate your clients’ needs, you can deliver an outstanding client experience that will not only keep your clients coming back to your spa but also increase the chances that they’ll tell others about your business. Not only will the restaurant gain referrals from me, but they have also created a life-long customer. Boom! Enjoy this article? Want to sharpen your skills in business, marketing, and leadership? Take a peek at how the Esthetician Inner Circle membership can help.